I blew off Final Fantasy for the Nintendo Entertainment System, without apologies, for almost two decades. Not because I hate roleplaying games, or random encounters, or, you know, Japan. No, I took a pass because at the time, and from a distance, the game screamed Ultima-for-dummies, i.e. a super-simple roleplaying experience for kids who hadn't laid eyes or fingers on an Apple II, Commodore 64, or Intel 386, much less roleplaying big-leaguers like Bard's Tale, Wizardry, and SSI's Gold Box series. That's my (sorry) excuse for jilting the maiden installment in the bestselling roleplaying series going. And after finally playing the PSP remake, it seems I got it wrong. Remember two-button joysticks? Keyboards without a mouse (keyboards that were computers, for that matter)? Coaxial box-adapters with sliders that let you switch between your computer and the TV? Put your wayback caps on, set the dial to 'mid-1980s', and let's try a little word association. What comes to mind if I say 'Final Fantasy analogue'? 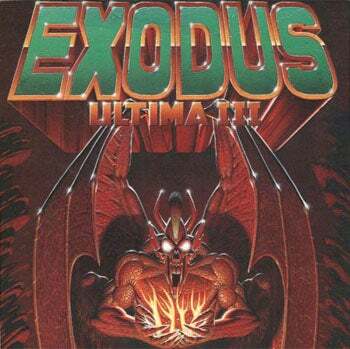 The box art for Origin's Ultima III: Exodus. Check out Exodus's Fu Manchu. Ultima III: Exodus, with its controversial "Hey, are you really promoting Satan?!?" game cover, was a creature of the early 1980s and the venerable Apple II computer family. It employed crude, chunky, primary color pixels to fake a world with mountains, plains, forests, and cities squashed flat. It traded a "you-hit-me, I-hit-you" combat system for zoomed-in, snap-away battle arenas that supported thoughtful tactical play. Your party-of-one in prior games became a party of many, each member maneuverable independently during skirmishes. 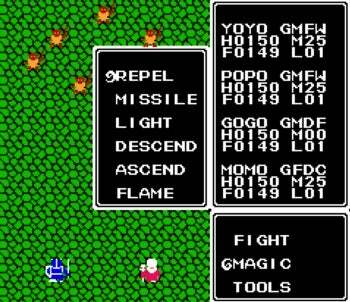 In exploration mode, you arrowed your party (represented by a single character) around the game's "overworld," scouting for treasure, bumping into enemies, accruing experience points to level up, and visiting towns to upgrade kit or restock supplies. Somewhere in all that was a story about an evil wizard and forgotten lands and diabolically magical computers, but it hardly mattered. The game was really about poking your head inside dungeons and wandering through fields of jutting gray triangles and neon-green blobs to answer questions like "What's that squiggly-looking thing over there?" 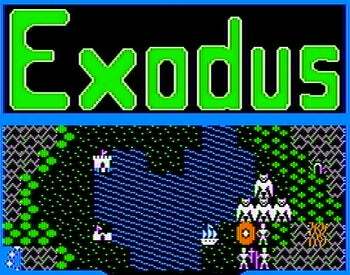 The title screen (and running demo) from Ultima 3: Exodus for the Apple II. Mad graphics for a computer game in 1983. The vertical battle screen--enemies up top, your party along the bottom--in Ultima III: Exodus for the NES. Final Fantasy for the NES hit Japan in 1987, but didn't finish paddling across the Pacific for its US debut until May 1990--seven years after the Apple version of Ultima III: Exodus, and roughly one after FCI's NES port. 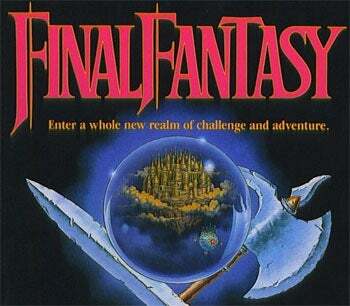 Snipped from the US NES box shot for Final Fantasy. 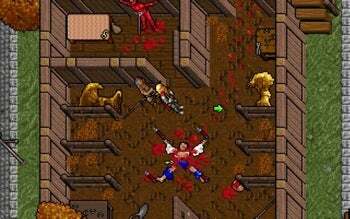 In May 1990 I'd just finished Ultima VI: The False Prophet--easily the most sophisticated CRPG then made--and was moving on to stuff like Eye of the Beholder and the Worlds of Ultima games. The NES was frankly in my rearview mirror. I was reading future-gazing stories about epic worlds replete with discrete physical objects like spades and spoons and scimitars you could actually heft or throw or quietly slip into your pockets. Also: Games with complex social and political themes, and that weren't afraid to put players in morally ambiguous situations. The infamous murder scene in the Britannian city, Trinsic. The game was 'voluntarily-rated' MP-13 by Origin, 'for mature players'. ...while NES games like Final Fantasy seemed to be gazing timidly backward, targeting younger players with simpler visuals and derivative gameplay. 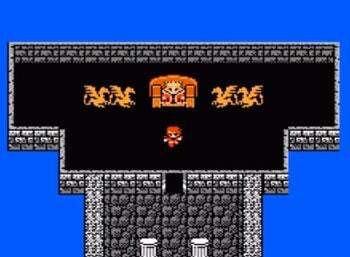 Chatting up the king (the squat little man-thing squeezed between head-high armrests) in Final Fantasy for the NES. Enter the Super Nintendo in August 1991. I bought one for games like Super Mario World, graduated to ActRaiser, stood by impatiently for Contra 3 and Castlevania IV, then stumbled on Final Fantasy II (the US version of Final Fantasy IV) when it appeared out of the blue on November 23, 1991. Still skeptical, I bought a copy.